A modern enigma that pays homage to the brand’s roots. If there was only one thing fashion fans can applaud Karl Lagerfeld for, it would be for keeping the historic fashion house of Chanel alive in these changing times. 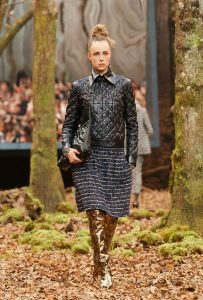 A good example of the creative director’s brilliance is the new Chanel 31 bag that was initially showcased at the runway show for Autumn Winter 2018/2019 Ready To Wear collection. The purse is a delightful modern enigma, capable of being worn in multiple ways and available in opposing colours that somehow just work. The Chanel 31 bag exudes boldness and freshness, acting as the perfect addition to any outfit or occasion. Despite the accessory being a distinct move towards modernity for Chanel, the bag acts as an anchor in time as it was created with the brand’s history in mind: the number 31 signals at the famous address of the luxury house on Rue Cambon. Discover this gem at the Chanel Ephemeral boutique in KLCC from the 20th September. The top products to create the perfect eye look. Embrace your inner child with LOEWE’s limited edition Dumbo Collection. We’re blinded by this massive rock. Feed your skin with vitamins, minerals, and antioxidants with an Oxygen facial.